Resin Seeds Feminised | Get Hold of Potent and Exclusive Cannabis Seeds! The Home of the Gold Standard of Medical Seeds: Cannatonic! Resin Seeds Creates 5-Star Feminized Seeds that Pop with Power & Flavour! 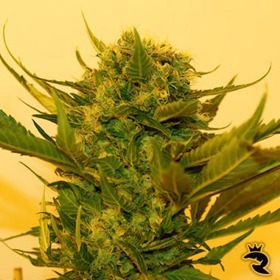 Resin Seeds is a world-class Spanish breeder that specializes in top-quality weed seeds for the medical marijuana community, although everyone seems to love the intense power, incredible flavours & killer effects that define these beans! Try one for yourself & discover what we mean! Our Favourite? The Extremely Fruity Yummy Seed! Don't let the candy-like aroma fool you. Bubblicious means business! She's stoned to the bone with 20% THC & killer Indica-dominant effects. Resin Seeds is the culmination of a lifetime of experiences for Jaime. As if having the legendary Soma as a father-in-law wasn’t enough, this motivated breeder was once part-owner of the famous Resin Coffeeshop in Amsterdam, and he opened one of the first Spanish grow shops in Barcelona. For Jaime, it was a natural progression to move on and start Resin Seeds. However, he’s never forgotten where he came from and still soaks up cannabis-related knowledge like a sponge. It’s this desire to never stop learning that has led to one of the most exciting lines of feminized cannabis seeds we’ve ever seen! Lush Flavours, Tantalizing Aromas, Intense Power & Smooth Smoke! Because Resin Seeds is a total super-star when it comes to producing the world’s finest cannabis seeds, you can bet that their line of feminized seeds is outstanding in every single way. In addition to a world-class gene pool, these guys have put together a testing program that a MENSA candidate would have a hard time passing. With this process in place, you can trust that every weed seed that makes it through is a top performer! So, what exactly will you find in the Resin Seeds lineup? We highly recommend Cannatonic, a MK-Ultra/G13 Haze hybrid that’s out of this world! Wonder how she gets her name? She’s one of the first feminized seeds to offer a near even THC/CBD ratio for the most intense, narcotic high in the world. Check this out - Cannatonic has a full 6.2% CBD. That’s almost unheard of! When you’re shopping for 5-star feminized seeds, why not buy them from someone who loves good smoke just as much as you do? If this sounds like a plan, Resin Seeds and Rhino Seeds is a match made in heaven! Both teams live, eat & breath 5-star cannabis seeds. Maybe that’s why these feminized seeds are priced to sell? Check ‘em out for yourself! Get Stunning Feminized Seeds from Resin Seeds & Rhino Seeds Now!